When you enter the sheep barn at the Branch County Fair it is filled with sheep. Most of those sheep being market wethers, primarily the Suffolk breed. There are a few stalls filled with Scottish Black-face, Shetland, a Romney, and Tunis, ours being the Tunis this year. When we were considering sheep we were told that if our girls would be participating at fair we should buy Suffolk sheep. We decided against that for a couple of reasons. We were not raising sheep for fair, Suffolk are a much larger breed than what I wanted to deal with, and we wanted a dual purpose breed that would produce quality wool. We still participate at our local fair, but we do stick out like a sore thumb in the barn! We don't mind. My girls have enjoyed showing off their sheep and they love when people stop to find out why their sheep do not like the rest of the sheep in the barn. It has been a great experience for them. We also bring a couple of fleeces to enter the "wool" competition. This year they were the only ones, so they got the big, pretty, purple ribbons. They will never be the "big" winners because we do not have the "right" breed. Some people have questioned why we do it. We do it because we love sheep and will do what we can to promote sheep and wool. The girls had a great time! They have friends in the sheep barn that show the Scottish Black Face. 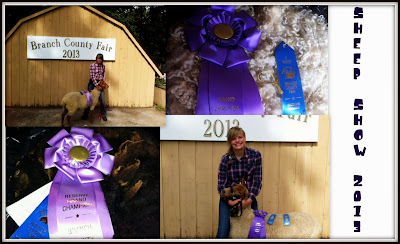 They enjoy the sheep project and look forward to many more years showing their ewes! Pretty ribbons! But even better, beautiful smile!! Well I sure don't know anything about sheep, but I think yours are beautiful! They have such great expressions on their faces, always! How did your daughter do in the photo competition? She got an A award on her photo project! Good for you for not being afraid to be different! Yay for the ribbons! Congratulations on the ribbons! There are more important things to consider than simply following the crowd. I love that you chose your sheep breed for the things that are important to you.